Look what i found last week.I just can't believe it !!! !, for just 2.50 dlls in 8.5 condition. Another Prostaff 90 to the collection. So when’s the 90 reissue coming? Great get! The K90 is one of the goat midsize racquets IMO. Beautiful! The best of the series, IMO. Now mosey over to my grommet petition and sign it! These things eat them!!! Getting back to my PS90. With good mechanics and timing, it feels incredible. I don't know if anything on the market can compare. Guys message me an offer if anyone is interested in a 9/10 condition K90. I haven't played with my ps six one 90 since last June and it has been left@home. After many months of using the Red Laver Cup RF97A I thought I would give the ps six one 90 a go in doubles. 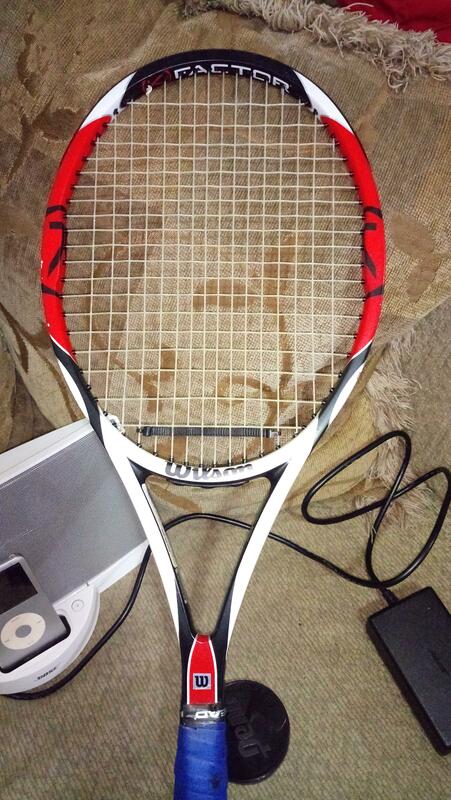 It is strung with Babolat VS Touch Natural Gut and Luxilon Alu Power Rough in June last year. I was amazed again with the accuracy and spin I was generating from serves whether first or second and slice backhands. It just feels much better than any other mid size raquet. Volleys felt great as well. I just tried a K90, I thought it would be too heavy nope... it felt amazing! Solid, dialed in, not cumbersome. Seriously enjoyable racquet! Welcome to the Pro Staff 90 thread. I just picked up a mint condition PS90 for a very good price. How fortunate is that, I couldn't believe my luck. The seller didn't know that ps90 was short for pro staff 90 and sent me pictures of a Babolat Pure Strike 16x19 in mint condition. Then I said I was after the pro staff 90. I've made the switch to the RF97, I'm sad to say. I finally figured out how to play with the racquet with 2 years of on and off play with it. I hope this doesn't mean my membership to the PS90 club is revoked. I still keep both of my 90s in my bag, one strung and ready to hit with at a moment's notice. I was actually dead set on switching to the VCORE Pro 97 330 after a very happy 20-25 hour playtest in December and was waiting for a sale on them hopefully during this year's black friday. Unfortunately in February I had some bad tennis weeks where my timing was horribly off on my 90s and I needed the RF to get me to go back to basics. Yes I know how funny that sounds, but I actually cleaned up my mechanics with the RF because it was so sluggish through the air and forced me to take slow easily timed swings. I played better on my 90 again after warming up with the RF for 30 minutes but in match play I don't have that luxury. When I saw the clearance sale on the black/white RF97 for so cheap and knowing I gelled with the all black one in my bag, I jumped on a pair of matched black/whites. If they weren't so cheap, I would have held out for the VCOREs and not gotten the RFs at all. I find the RF97 to play similar enough to a PS90 that I can switch between the too without too much adjustment. Very similar static and swing weights, and identical launch angles. The only differences are that the PS90 swings slightly faster, makes sharper slices and allows for more precise shotmaking, WHEN you are dialed in. Anyway, I like both, but tend to play with the RF97 and just mess around with the PS90 these days. 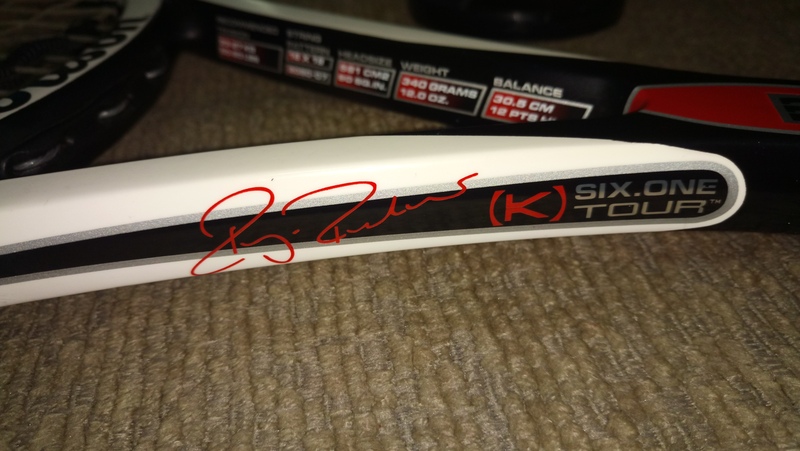 My favorite racquet is still the 6.1 95 16x18 which to me is like a combination between the RF97 and the PS90. Unfortunately the paintjobs are so dated on the 6.1 that I don't play with it anymore even though I have 7 of them in the closet lol. I'm 100% with you on the 90 being the better racquet when dialed in. When I'm feeling good, that's the racquet I reach for first without any second thoughts. It is the most confidence-inspiring racquet I have ever used. Swing as hard as you want with full knowledge the ball is going where you want 9 times out of 10 and the other 1 time being a shank from too much RHS. Hi, i used to play with the PS90 (blx tour red and black) a few years ago, i switched because it was too heavy and on the second hour of play my arm was all tired and my play downgraded a lot. I tested the RF97 and Vcore pro 330 and had a similar problem. Great 1st set, terrible 2nd set, forget about the 3rd. So i just settled for a customized Vcore pro 310g. 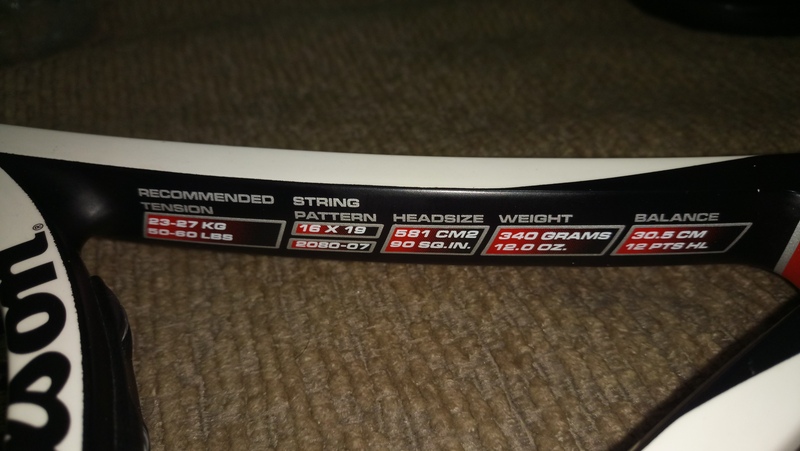 Until yesterday i was fine, but looking around a website that sells used racquets, i found 2 k90 that they say is "pro stock", that has the same specs of the original pro staff 90, but weighting 320g unstrung and not 339g. 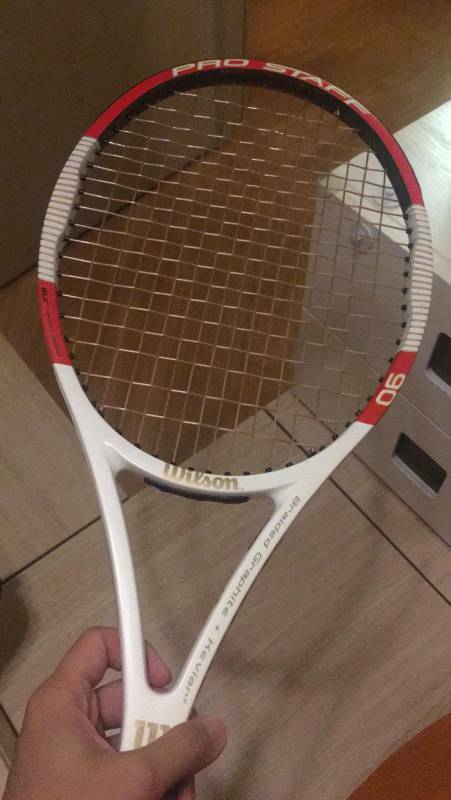 I am really wondering if this racquet will be a more manuverable PS90 without the heft. Has anyone played with something similar? Actually I believe that you have 2 Asian version K90s. The specs on those are 320 weight 9 points head light. I have the BLX asian version with the same specs and I use it when im playing hard hitters because it is easier to swing, otherwise I use my PS90. Ever since my wrist injury my main stick has been the Pure Strike (One7) 16x19 but I do use my 2012 PS90 on a regular basis. I’ve set up my Strikes to match my PS90’s SW of 340 so the transition is easy. Only difference is that the PS90 generates far more spin because the Strike’s sweet spot is very dense, whereas the PS90’s string spacing is more open and even throughout all 90 sq inches of real estate. The 90 cuts through the air far better as well. I’m hesitant to revert to the 90 primarily because my wrist can’t handle too much mass near the handle. When I’m in good form the 90 does the two things I like most far better than the Strike does, ie serve + forehand. Same with me and the RF97 vs PS90. I also like PS90 more on slice and drop volleys. Pretty much the only places I like the RF more when I'm playing my best with both frames is the flattened out backhand and purposeful heavy volleys. Thanks. I might give them a try. Those are Asian spec K90’s and are the Holy Grail.